This entry was posted in Roles & responsibilities on 2016/02/17 by Susan. Each year on average 24 workers in BC are killed and another 1,304 are injured due to motor vehicle crashes. During Road Safety at Work Week March 7 to 11, employers are asked to take action on the issue of workplace road safety. Road Safety at Work (RSAW) Week is an annual event that provides opportunities for BC workplaces to improve awareness of road safety in the workplace and to adopt safe occupational driving practices. A robust road safety program should be part of the company’s overall health and safety program. Employers have responsibilities for the safety of their employees when they are driving any vehicle – even a scooter – for work. RSAW has many offerings on its roadsafetyatwork.ca website, including the online course “Know Your Responsibilities,” quizzes, a tailgate meeting guide, and other resources. RSAW Week was initiated by Road Safety At Work, a group managed by the Justice Institute of BC and funded by WorkSafeBC. Why focus on drivers at work? Road safety is important for everyone, but working drivers are in a different situation than other commuters. Workers go where they are told to go, in many cases. Part of their safety rests in the hands of those who dispatch them to drive for company business. “As an employer, you have the same duty to ensure the safety of your employees when they are behind the wheel driving for work as when they are in the office, on the shop floor or on a construction site,” says the RSAW website. I contacted Rick Walters, fleet safety program manager at the Road Safety at Work Alliance. I asked him how employers benefit from taking part in the week’s events. 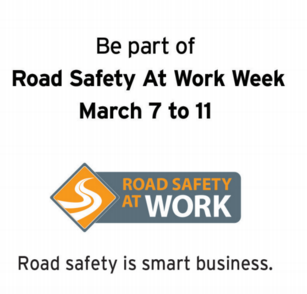 Thanks to Rick for telling me more, and please let me know if (and how) you are taking part in Road Safety at Work Week from March 7 to 11, 2016. Here are many suggestions for promoting Road Safety at Work Week.